When high school junior standout athlete Giacomo Brancato walked into the Mission Training Center in January 2015 with his basketball coach just weeks after he was diagnosed with non-Hodgkins Lymphoma and only days before his first round of chemo, something rather gigantic shifted. Hope, aligned with guts, determination and talent, met the inspiration and practical tools needed to get past this devil. Giacomo trained at the Center while he fought the torturous effects of the treatment needed to save his life. His mom attended nutrition classes to learn how to feed his fight. 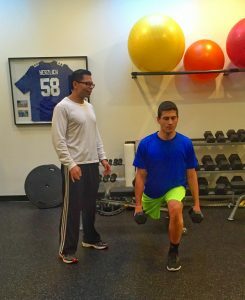 Giacomo continues to work out at the Center, augmenting his daily practices for the Varsity high school baseball and basketball he plays. He’s strong. He’s confident. He’s back. Last winter he earned first-team All-FCIAC honors in basketball and went on to play for a high school state championship in baseball. Next year he will attend Fairfield University where he was recruited to play D-1 baseball. For more about Giacomo, click here.